Something that I have always struggled with is caring too much about what other people think. Ever since I was little I stepped on tip-toes around certain people to preserve their opinion of me and not cause ripples. We all have people in our lives that do not want to hear opinions contrary to their own because they always have to be right. When I come across a kind and uplifting individual that is up in years, I cherish their friendship and advise. I love that for all the rude and un-filtered individuals in my life, there are many more that have impacted me in a good way. How thankful I am for those that listen to my opinions and respond with a kind word. So, don’t be a shrimp. 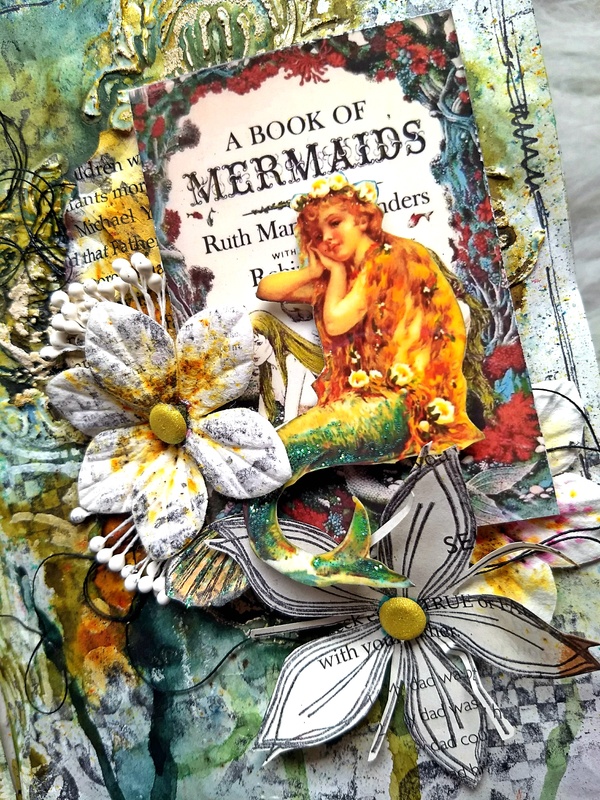 Be a….mermaid? I am still on the mermaid journal but I can feel my inspiration draining. I have a few more layouts to share and then I will be closing this book. I love putting an idea to paper but after a while I need a new topic to pour myself into. Usually I have two journals going at the same time because of this. My background is a combination of PaperArtsy Infusions, Embossing and stenciling with Gwen’s new Decorative Flower Stamen Medallion. 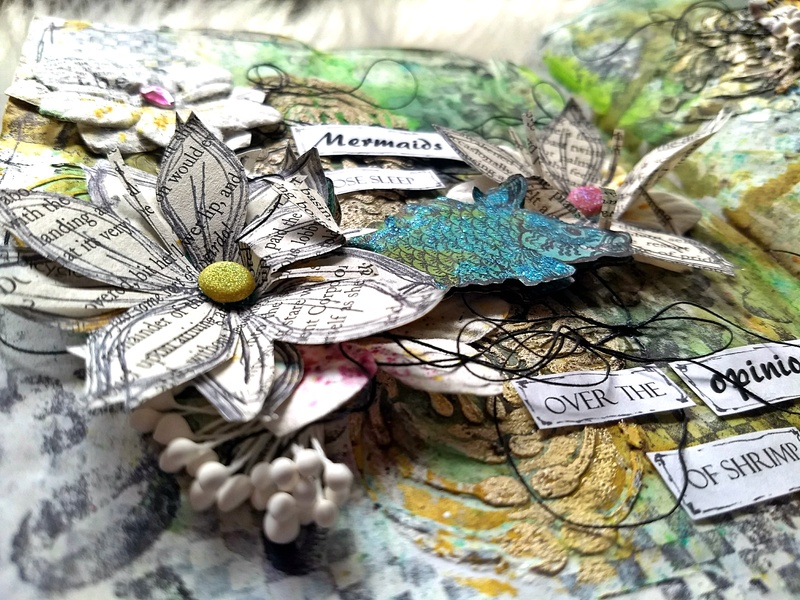 The paper flowers are I Am Roses and the stamped flowers and fish are by PaperArtsy. The checkered background is a Tim Holtz stamp. I used a bit of thread, printed images and a typed quote. First, I”m not sure just older people are unkind. I think some learn from an early age how to manipulate. They have learned what buttons they can push and how far they can take it. These master manipulators may get worse with years, but they have been like this since more than likely about the time they learned how to talk. It’s good that you are now standing up for yourself and your children, and that a loving husband helps. This is a marvelous spread, Kate. I also need to switch to other interests or loose incentive, too. I think you are doing a marvelous job in this journal and I absolutely LOVE this spread. 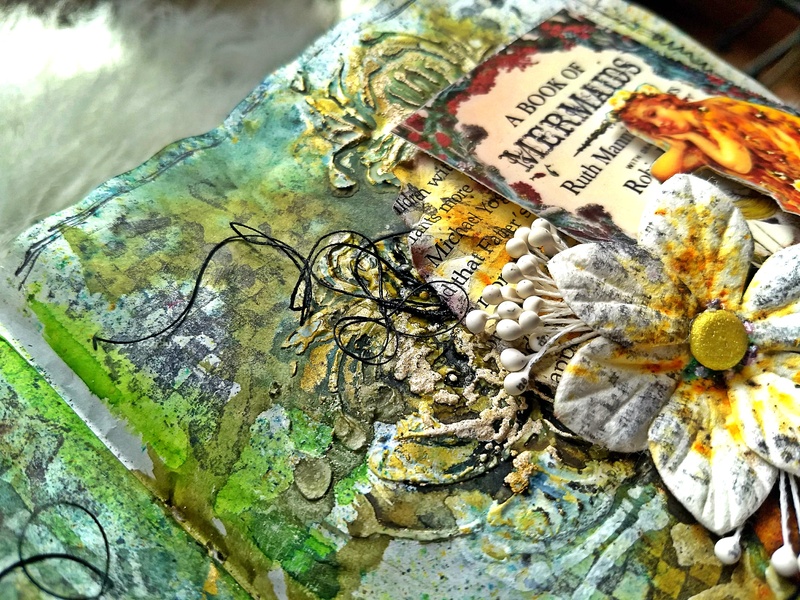 In fact, it would be a great entry for Jo’s Flora and Fauna at Art Journal Journey, too. Those beautiful flowers you created are perfect for the challenge. I adore this Kate! Great job! My husband and I say the same about older people! I love your quote about the Etiquette being disabled! hahaa I lol! His Mom is like that about his weight! for shame! Sorry you have to endure these comments- poo poo to those who can’t say anything nice! 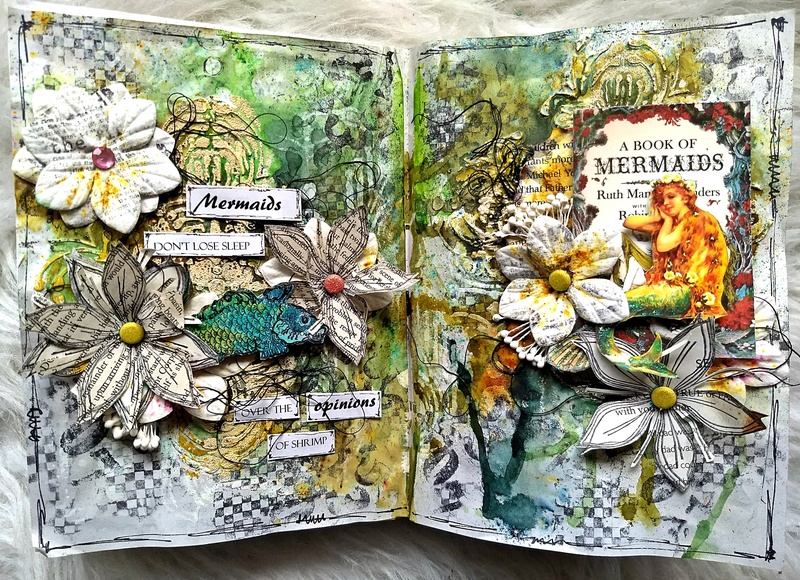 Anyway, these pages are beautiful and the whole mermaid journal is just gorgeous! Your layout is beautiful! I love the rich colours and embellishments. Simply magical! I absolutely adore this page Kate, the colours and textures are just amazing, you always manage to take mixed media to the next level! I am so sorry to hear about all those “shrimps” you have encountered. Elderly people should have gained wisdom, not scorn, very sad. All I can say is, may there be many more “mermaids” in your future!!! What a wonderful and very beautiful spread this is, I love it!! Another fabulous spread, Kate, as always your work inspires me with its beautiful use of colour and layers – just lovely 🙂 As for people who criticise you or give you un-called for advice – they’re obviously the ones feeling unsure about themselves, because otherwise why would they feel the need to put others down? I think it was the indomitable Eleanor Roosevelt who said (and this is somewhat paraphrased) – ‘other people can only make you feel bad with *your* permission’ – yes, it’s something I struggle with too, but stuff the haters LOL! I love your fantastic spread Kate – it’s so beautiful! I have also learnt with the years not to care too much about what other people do, think or own. It’s MY life – but I know what you mean… we all have that thoughts about what others could think about what we make or how we look like and so on. enviously about the next generations! Don’t care about it too much!